The Saker falcon (Falco cherrug Gray, 1834) is a bird leading to the well known order of the Falconiformes and to the family Falconidae, genus Falco. For the genus Falco it’s matter of a big falconid. 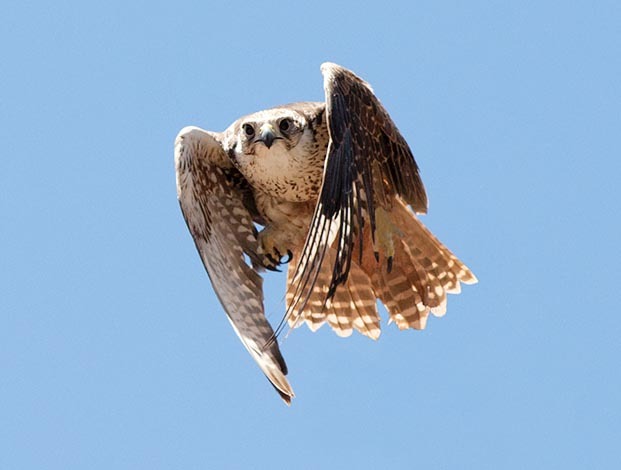 In the context of falconry, in Asia, it is not less utilized than the Peregrine falcon (Falco peregrinus) in Europe. 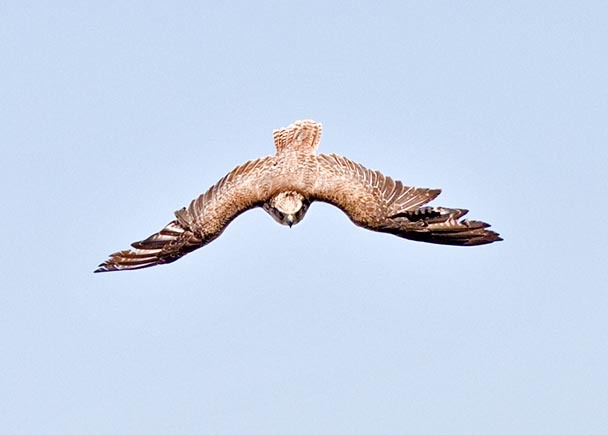 This big falcon is absent in Italy, whilst it is not rare in Eastern Europe and in Western Asia. In some cases, it reaches even the Manchuria. During the winter, it ventures fairly southward in the boreal hemisphere, up to the Ethiopian region, in the African continent. It is therefore found in a good part of the Palaearctic ecozone. It colonizes quite well the open and barren areas, with few trees, such as steppe, heaths, berries moorlands, stony grounds areas. Considerably larger than most of the other species of the genus Falco, it reaches the remarkable size of 60 cm of total length. The female is somewhat bigger than the male. The colour of the upper parts is brown, varied and interrupted by some whitish dots on the scapular areas, which, being not found in any other species, render this animal easily recognizable. It’s a bird which hunts birds of considerable size and small mammals, which it can locate thanks to its powerful eyesight, and for this reason it is utilized by the falconers in the hunting context. 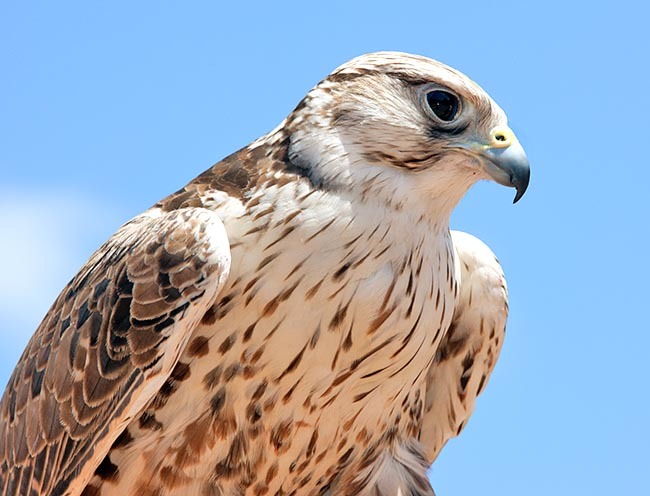 Both the IUCN and the Birdlife Association, consider this species of falcon to be in serious risk of extinction. The individuals in the wild are thought to amount, nowadays, to 7.000 specimens only. As mentioned in the introduction on the diurnal raptors, the Falco cherrug belongs to those species of raptors that do not build a nest during their reproductive cycle; a fact probably induced by the nature of the biotopes where they live. Practically, they often use old abandoned nests of crows, buzzards, ravens and jackdaws, built between the branches of the trees or in rocky cavities. The female lays from 3 to 5 eggs and both parents care the altricial-inept progeny. 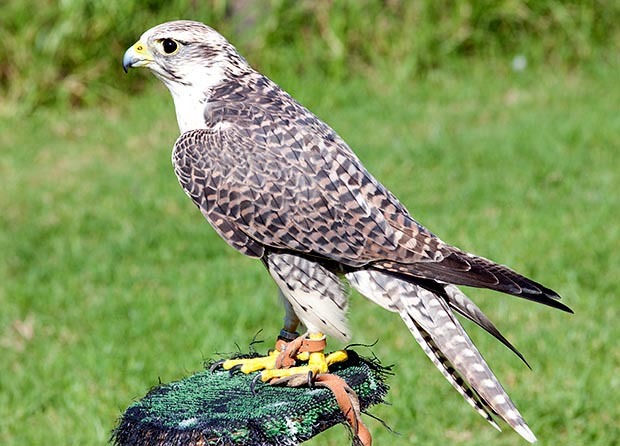 Since time, also a hybrid falcon, born from the union of the Gyrfalcon x Saker falcon, or, in scientific terms, Falco rusticolus x Falco cherrug, is utilized for hunting. In French, it is called Faucon Gerfaut x Sacre, in English Gyrfalcon x Saker Falcon, in Catalan Falcó Grifo x Sagrat, in Spanish Halcόn Gerifalte x Sacre, in German Gerfalke x Sakerfalke,and in Portuguese Falcâo Girifalte x Sacre. It is bigger than the nominal species, Falco cherrug and Falco rusticolus, as well as than their subspecies or races. Its origin is ancient. As a matter of fact, it was present already in the Middle Age and was very much utilized by the court falconers, both Italian and French, due to its aggressiveness, courage and skill in hunting, for instance in being able to drive out hares, foxes, badgers, etc. Nowadays, apart from a few falconry school or zoological garden, it is frequent only in the Arab Emirates, as it is a status symbol and chairs the most important meetings of the sheikhs. In the nature, grown-wild, it is found in the tundra of northern USA and Canada, as well as in the Eurasian one. It has a much more striped livery (with black stripes and bands on a beige-grey background) than the pure species, the whole of the design confers the bird, with outstretched wings, a very thick horizontal bands geometry, and when the wings are closed, the same appears as maculated. It nourishes of birds of various type, such as partridges, moorhens, sandpipers, starlings, even seagulls and of small mammals. Also the female of this splendid hybrid is about the 7% bigger than the male and weighs the 66% more. The intermediate age is the most appreciated by the falconers, due to the beauty of the livery, the strength and the skill in hunting, which at that age reaches its top.